Grow your puppies’ brains with this innovative tool that will help them become confident, stable puppies. Add an Adventure Box to their play area, and watch massive learning take place while you sit back and enjoy the fun! 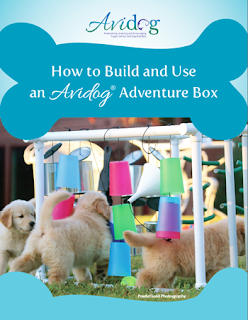 An Avidog's Adventure Box is a fun way to introduce your next litter to a world of sights, sounds, touch, and motion! Scroll down the linked page, and give them your name and email address. They will send you How To Build And Use An Adventure Box , their step-by-step construction plans, for FREE!